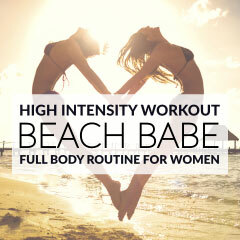 Stay in shape and tone your whole body in just 20 minutes with this full body summer workout! 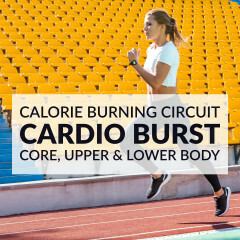 This total body toner routine improves your cardiovascular endurance, strengthens the core, lower and upper body and helps you burn some of those extra buffet calories! Start this total body toner circuit with a full body warm up routine. 1. Knee and elbow press up: 60 seconds. Start with your knees and elbows on the floor, the elbows under the shoulders and the knees under the hips. Straighten your arms and legs simultaneously and lift the hips toward the ceiling. Return to the starting position and repeat for 60 seconds. 2. Dumbbell overhead rainbow: 60 seconds. Stand straight with your feet wide and hold a dumbbell in each hand. Rotate your body to the right and bring the dumbbells up to shoulder height, with your hands facing each other. As you rotate your body to face front, bring the dumbbells up and over your head and lower the dumbbells as you rotate your body to the left. Rotate your body again to face front, lift the dumbbells and repeat. 3. Double pulse squat jump: 60 seconds. Stand with your feet shoulder-width apart and the toes pointing slightly outward. Bend your knees, pressing your hips back, and squat until the thighs are parallel with the floor. Lift your hips a few inches up and squat again. Push through the heels to jump straight up. Land with your knees slightly bent and go back into the squat position. Repeat until the set is complete. 4. Chest fly glute bridge: 60 seconds. Lie on your backs holding a dumbbell in each hand, bend your knees and straighten your arms out to the sides. Lift your hips off the mat and then bring the dumbbells up with your palms facing each other. Lower your arms and hips back to the starting position and repeat the movement for 60 seconds. 5. Boat twist: 60 seconds. Sit down on a mat with your knees bent, extend your arms out to the sides and lift your feet off the floor. Twist your torso to the right, and then reverse the motion, twisting it to the left. 6. Reverse lunge medicine ball overhead press: 60 seconds. Stand with your feet hip-width apart and hold a medicine ball or a dumbbell in your right hand at shoulder height. Take a step back with your right leg and flex your knees until the back knee is just above the floor. Stand back up, bring the medicine ball up and over your head and switch it to your left hand. Take a step back with your left leg, lower the medicine ball and lunge. Stand back up, bring the medicine ball up and over your head and switch it to your right hand. Repeat for 60 seconds. Finish this 20 minute full body summer workout with a quick stretching routine. Burn those extra buffet calories by sneaking this 20-minute full body workout into your fun!